Supra is back at the track! Beginning in 2019, the iconic sports car will prove its championship mettle in the hotly contested NASCAR Xfinity Series (NXS). Although the Supra which has been popular as a flagship sports car in Toyota for a long time ceased production in 2002, it revived as "GR Supra Racing Concept" at the 88th Geneva International Motor Show* earlier this year, demonstrating Toyota's commitment to bringing the Supra back to the market. Supra's heritage at Toyota has long been enhanced by its success in motorsports, and we hope to continue to watch its history play out in the coming model. 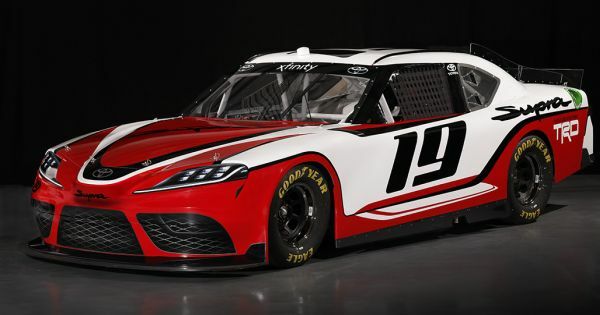 On July 5, the NASCAR Supra was unveiled at the International Speedway in Daytona Beach, Florida, where the 18th round of the NASCAR Cup Series and the 16th round of the Xfinity Series are held. It will make its on-track debut in the NXS race at Daytona on Saturday, February 16, 2019. Toyota worked with its subsidiaries, TRD, U.S.A. (Toyota Racing Development) in Salisbury, North Carolina, and Calty Design Research, Inc. (Calty) in Newport Beach, California, to develop a Supra for NASCAR competition. Toyota has fielded Camry in NXS competition since 2007, and the 2019 season marks the first year Toyota will field a different model in all three of NASCAR's national series–Camry at the Monster Energy NASCAR Cup Series (MENCS) level, Supra in the NXS, and Tundra in the NASCAR Camping World Truck Series (NCWTS).Toyota also expects its new Supra to reach the market during the first half of 2019 worldwide.